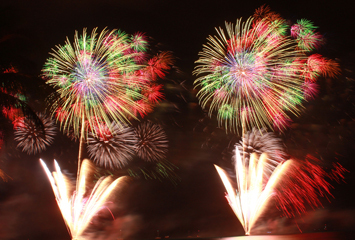 In Japan, Nagaoka Fireworks is recognized as one of the ”Japan’s Three Great Fireworks” among many fireworks shows. 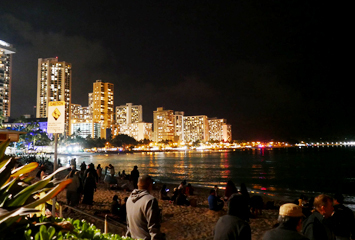 The Japanese fireworks shells were shot off of Waikiki Beach. 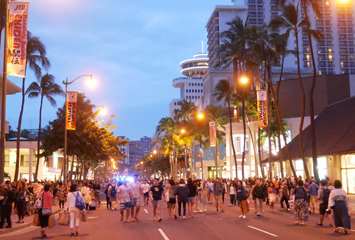 When the Grand Parade ended, people headed down towards Waikiki Beach. They walked hurriedly in order to save good spots to view the fireworks. It was unnecessary to worry. 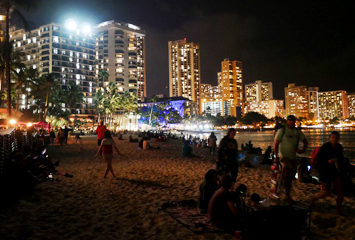 Since the fireworks were shot from off shore of Waikiki Beach, there were magnificent views from anywhere on the beach. Unlike Japanese fireworks shows, where crowds pack the place, Nagaoka Fireworks in Hawaii is known to be more accessible without extreme congestion. There was one hour between the ending of the parade and the beginning of the Fireworks. People sat on the beach and with great enthusiasm waited for the spectacular show to begin. This was the 7th annual Nagaoka Fireworks show in Hawaii. How and when did this event originate? 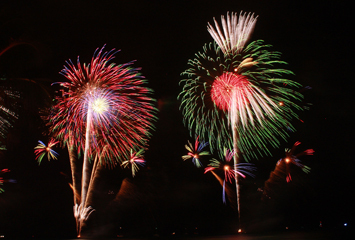 There is a compelling history between Hawaii and Nagaoka that set the stage for Nagaoka Fireworks in Hawaii. 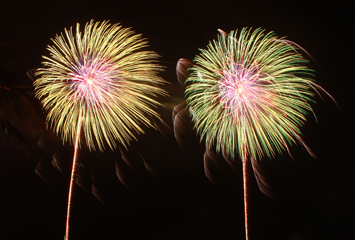 Nagaoka Fireworks have been popular among Japanese people since the Meiji-era. It was interrupted for several years from 1938 due to the WWII. On August 1, 1945, Nagaoka suffered severe damage in an unexpected air-raid; the town was burned down beyond recognition and the lives of many people were lost. After the war ended, war memorial festivals were held for several years to encourage the people of Nagaoka in their efforts to recover. The festivities included the restarting of Nagaoka Fireworks, which became an annual memorial event to call for restoration and peace. In 2007, the Nagaoka mayor explained, at the mayoral exchange conference in Honolulu, the relationship between Honolulu and Nagaoka during the Pacific War. The Pearl Harbor attack, which led to the United States’ entry into the Pacific War, was directed by Japanese Admiral Isoroku Yamamoto from Nagaoka. At the surprise attack, many precious lives were lost. Soon Japan military forces had to fight the all-out and prolonged war. Finally, in the evening of August 1, 1945, at the end of the war.Nagaoka City was air-raided by the U.S. Army Air Forces. Honolulu suffered severe damage in the surprise attack at Pearl Harbor by the Imperial Japanese Navy. Nagaoka, on the other hand, the birthplace of Isoroku Yamamoto who directed the Pearl Harbor attack, was destroyed in the bombing by the American forces. Since then, the two former enemy cities worked towards reconciliation, seeking to build a friendly and peaceful Japan-U.S. relationship. Eventually in 2012, Nagaoka and Hawaii became sister cities. 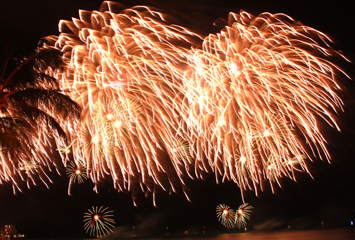 Nagaoka supports the Honolulu Festival by displaying fireworks on the final evening. 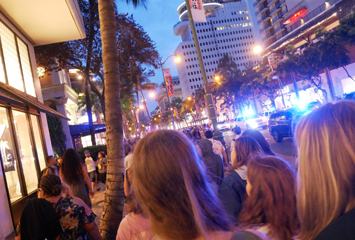 While fireworks shows are generally held at festive occasions in America, the Nagaoka Fireworks at the Honolulu Festival expresses the determination of the cities of Nagaoka and Honolulu to pursue peace. 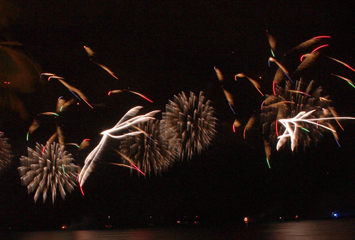 At 8:30p.m., a loud sound and flashing light accompanied the bright white fireworks. 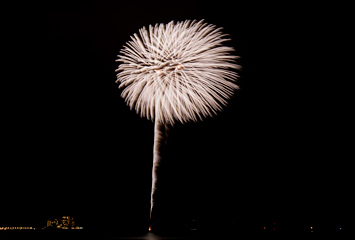 The first fireworks expressed a “prayer for peace.” The Nagaoka Fireworks began! 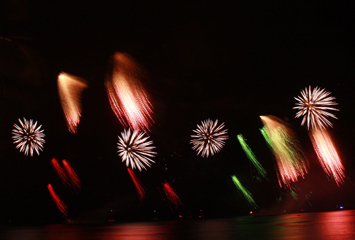 The first fireworks were followed by the three bright white fireworks in the night sky. They were dedicated to commemorate the Japanese and American war victims, to strengthen the bonds between the two countries, and to pursue long-lasting world peace. 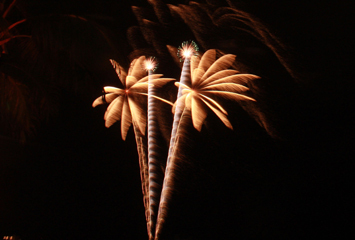 Tropical motifs, Hawaiian palm trees, the ocean, and the sun, were displayed in these fireworks. The fireworks “Phoenix”, a symbol of war-torn Nagaoka’s recovery, were launched as prayers for the recovery efforts of those who suffered in the great earthquake in Japan. This fireworks was unique because it spread widely in the sky rather than soaring high, creating the serene and mysterious ambiance. In the bright sparks, appeared the glittering shape of “Phoenix”. 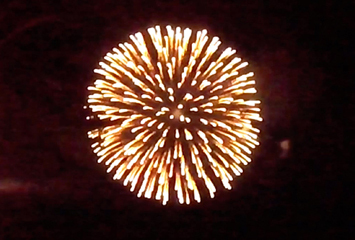 The hope for the growing friendship between Hawaii and Nagaoka was incorporated in the fireworks. 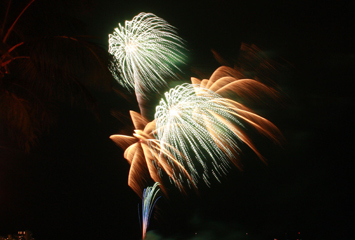 Near the end, the golden fireworks filled the night sky with the flashing image of King Kamehameha the Great. The finale was the launch of “Ten-Chi-Jin”. The gorgeously illuminating fireworks were shot up, wishing for the prosperity and happiness for the future young generations. The spectators broke out in cheers at the amazing display. 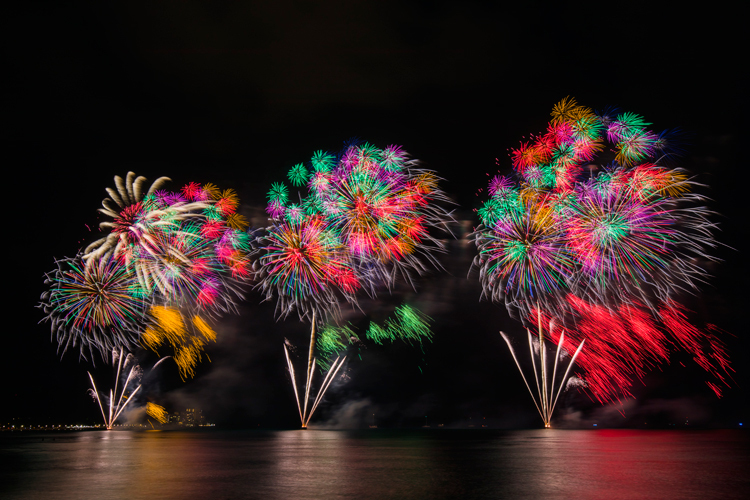 During the thirteen minutes of the Nagaoka fireworks show, 2,200 shells were shot and the splendid display brightened the Waikiki night sky, filling the spectators’ hearts with delight. Each fireworks was displayed with deep meaning – and as people gazed upon them, it engraved the message of hope for peace in their hearts. We hope to expand the exchange programs for diverse ethnic groups and generations, to build up friendly relationships among Japan, Hawaii, and the countries from the Pacific Rim, and furthermore to contribute to world peace. We would like to thank the cities of Nagaoka and Honolulu and our sponsors, who gave the Nagaoka Fireworks tremendous support and cooperation. We also would like to thank everyone who spent many hours in planning and carrying out the event.